Albeit the negligible amount of greenhouse gases emitted by Somaliland, its people already face the harsh consequences of climate change. Since 2013, water shortage and the lack of pasture have made at least 30% of Somaliland’s sheep and goats starve to death. The situation in Somaliland today is also a warning for the future: according to the World Bank, climate change can put more than 100 million people into poverty by 2030. The cows were the first to die, 10 of them. Then most of the 20 sheep went, and after that most of the 40 goats. As the drought in the Horn of Africa gradually killed everything Farhan Abdi Ali had worked for, all his life savings, he separated his animals into two groups: Those that produced offspring that could be sold, and those that produced milk. Besides being a source of nutrition for his 13 children, the milk provided a nice supplemental income throughout the year from cheese his wife made and sold. Ali lives in Somaliland, the self-declared independent nation that emerged in the north of conflict-ridden Somalia, and one of the largest hubs for livestock in the world. Somalilanders sell animals, mostly sheep and goats, usually for less than $100 each, to traders from Saudi Arabia and other Gulf states. One-third of Somaliland's economy, the fourth-poorest in the world according to the World Bank, depends on livestock. But by 2012, there were no animals left for Ali to sell. The few sheep and goats that hadn't withered away were too weak to reproduce. So he went home. From Lebisagal, on the border of Ethiopia and Somaliland, Ali traveled south to Mbale, the village where he was born and was married. There, he borrowed money from family, sold his last asset — his camel — and prepared to move. Camels sell for as much as $1,500 each. That was two years ago. Since then, Ali and his family have been living in camps for people displaced by drought, becoming part of the more than 80,000 people who are refugees within their own, unrecognized country. For the past year the Ali family has been in Digaale, a settlement outside of Hargeisa, Somaliland's capital. Digaale is a camp for people like him: People who have lost everything as their land dries because of climate change. Digaale is a formal settlement, supported by a consortium of international non-governmental organizations (NGOs), but across Somaliland there are many informal camps for IDPs, internally displaced people, who used to live off the land but now have joined small communes in which they support one another. Luckily for them, Somali culture endorses sharing. Taxi drivers in Hargeisa easily give money to the few beggars in the street — some days you're up and some days you're down. Those who are flush help those who aren't. Things can change. For the past two months, Ali has worked six days a week on leveling the rocky main road that connects the camp to the capital, making passage to the city easier. He can make $127 a month doing this tedious, grueling task as part of "cash for work," a program the NGOs have coordinated that pays IDPs to develop their settlements. That monthly salary is about what Ali would make selling one or two animals, if any were still alive. The states that make up the Horn of Africa — Somalia, Somaliland, Ethiopia, Eritrea, and Djibouti — have been drying out for decades. Though denial abounds — everyone seems to be waiting for the rains to come as they used to — drought is the new normal. Scientists have recently discovered that there is a direct correlation between the decades of dryness in the Horn and the rise in carbon emissions. This is a devastating problem for Somaliland, which emits negligible amount of greenhouse gases due to its extreme poverty, but whose people suffer directly from the consequences of climate change. Experts say that between 30 to 40 percent of Somaliland's sheep and goats have starved to death for lack of pasture and water since 2013. More than 240,000 people in Somaliland do not have enough food. Every season more and more are displaced. "Soon we will be a whole country of IDPs," joked Abdishakur Suluub Hersi, a consultant on the Drought Risk Reduction project, grimly. A former British protectorate, Somaliland was actually founded to be a meat supplier. In the 1880s it was created to ensure the British troops at the key port outpost in Aden, part of Yemen today, had meat, garnering the area the nickname "Aden's Butcher Shop." A century later, in 1991, during the middle of the civil war that has yet to end in Somalia, Somaliland claimed independence. Though it has its own government and currency, no nation or international organization recognizes it as a country. Somalia still claims Somaliland as part of its territory, but the national authority in Mogadishu is too busy fighting al Shabaab, the fundamentalist al Qaeda-affiliated group at war with the government, to think about taking it back. Today, Somaliland is still one of the biggest suppliers of livestock in the world, feeding people and markets in the Arabian peninsula and providing millions of animals to be killed as sacrificial offers during the hajj pilgrimage in Saudi Arabia. The UN's Food and Agriculture organization (FAO) estimated that in 2014 Somaliland and parts of Somalia exported a combined 5 million heads of livestock, worth an estimated $360 million. Almost everyone in Somaliland is involved in livestock, from raising it to transporting it to trading it to selling it. "It's our fuel," said Ahmed Haybe, director of Veterinary Services at the Ministry of Agriculture. "Some countries run on oil, we run on livestock. The whole thing is broken if the animals get sick." More than 100 million people across the world could be pushed into poverty because of climate change by 2030, according to a recent World Bank study, and in Somaliland this is already happening. Of the two seasonal rains in the Horn of Africa, the "long rains" between March and May have been decreasing annually for the past 30 years, said Peter deMenocal, who heads the Center for Climate and Life at Columbia University's Lamont-Doherty Earth Observatory. He is also a co-author of the groundbreaking study released earlier this fall that found that the Horn of Africa is drying in sync with the climate. Because the "long rains" make up the majority of the yearly rainfall in the Horn, the decrease is desiccating the region. That's happening even as further south, torrential rains brought on by the El Niño weather phenomenon cause devastating floods. One of those herders hit hard by the drought is Marian Hussain, 60, who used to to have 300 goats. Now she has five, and they are all dying. She lives in an impromptu IDP camp on the beach of Lughaya, on the coast of Somaliland near Djibouti. It's really a clump of colorful makeshift tents with sandy floors, populated by wizened faces. Occasionally it rains lightly: Just a tease, really, not enough to make a difference but enough to make the fabric houses permanently damp and musty. According to the local religious authorities in Lughaya, the UN's World Food Program had promised 7,000 tents and plastic sheeting, but none have arrived. South from Lughaya along the coast in El Lahay village, a bone-jarring, hours-long drive from Hargeisa, Ahmed Hash had 400 sheep and goats; now he was 130. Last year he sold 50 animals, but this year he hasn't sold any, because they are too weak. Ali Abukar had 300 goats, but now he's down to three. After losing almost all his livestock, he came down to El Lahay with his wife and his daughter. They survive on loans of rice from the village chiefs. His other four children are spread across Hargeisa, staying with relatives so they can attend school. Moosa and Aisha Jama spend their days with dead and dying animals. Carcasses in varying stages of decay are scattered on their land. When all the livestock have starved to death, the family will move to one of the informal IDP camps. They've lost about 180 sheep and goats, and the approximately 20 they have remaining are too weak to stand, let alone to walk. The animals kneel together in a shriveling mass on the family's homestead between Lughaya and Kalolwe, another town on the coast. But for the Jamas to leave their animals, even though they're only half alive, would be like ripping up money. One of those light, teasing rains fell in early November, the first in months — even years, some locals said. But it came as a mixed blessing. The accompanying chill killed some of the weakest animals, too fragile for even a drizzle. Though it doesn't play as dramatically in the press, this slow but steady drying has been worse than the dramatic, extreme shocks that have hit the Horn. The drought-related famine in Ethiopia in 1984 resulted in an unprecedented flurry of international donations and activism after photos of starving, big-eyed children appeared in the media, inspiring the founding of Bob Geldof's Band Aid and the anthem "Do They Know It's Christmas?" "A big, heavy 'sudden onset' disaster is really bad news in the short term, but recovery is often quick. Recurrent crises, even if lower in intensity, really sap the ability of farmers and livestock producers to respond," said Richard Trenchard, the head of FAO's Somalia office. Though Somaliland and the Horn of Africa are vivid examples of the impact of climate change, it isn't as heavily studied as less affected parts of the world. Not necessarily because the region is neglected, according to Columbia University's deMenocal, but because it is "poorly observed." Lack of communication between scientists, development officers and policymakers also delays action. 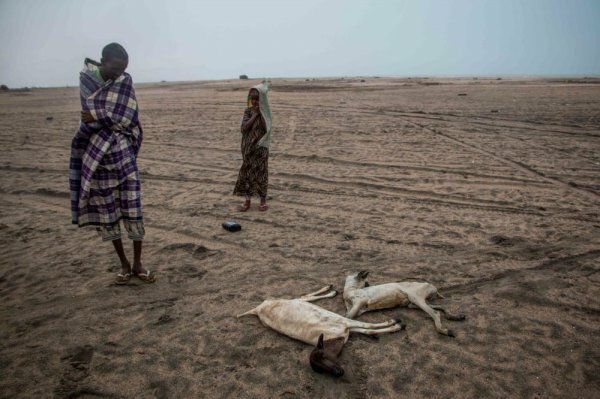 For example, a key player in the drought response in the region, the chief technical advisor to FAO's Somalia Water and Land Information Management project, said that he had not heard of the latest research connecting the rise in carbon emissions to acute, prolonged drought. "It's a place where we have very few observations, whereas in the US and Europe, we have tons of observations, going back decades, even centuries," deMenocal said. He named lower population and the lack of reporting stations, local scientists and telecommunications to transmit data as factors to account for the lack of accurate observation. But the overarching reason for the lack of attention to Somaliland is one that continuing climate change, in a perverse spiral, will only make worse. "Basically," said deMenocal, "because they're poor."